A sporting site in Melbourne is being used for a weed-tackling treatment that doesn't contain herbicides. A group of green thumbs have used steam to kill weeds, instead of applying chemicals. The Weed Network's Dr. David Low said they were trialling the method at Bayside Council sites. He said they had been researching chemical-free methods for working with weeds for five years. 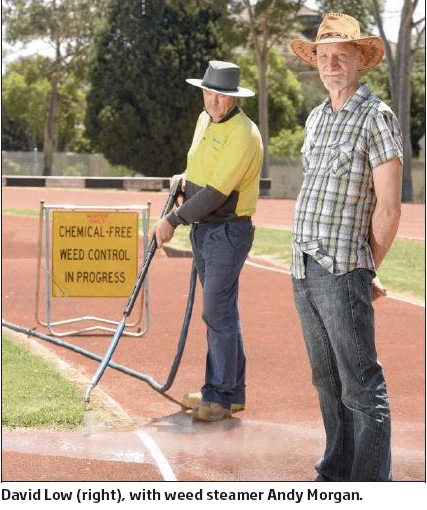 “We have been working with Bayside Council to introduce steam weeding as an alternative to herbicide in sensitive sites used heavily by children, for example for athletics,” Dr. Low said. He said a survey exploring attitudes towards herbicide use has found that 78 per cent per cent of people who used them believed they contributed to pollution. Dr. Low said the findings showed a majority of people were worried about the health and environmental effects of herbicides. “People are recognising that the chemicals commonly used to manage weeds are causing pollution and health issues. They want something done to reduce this source of pollution,” he said.